At Family Dental Care Center, we take pride in being the leading dental services provider for the residents of Lansdowne, Drexel Hill, Aldan, and the surrounding communities. Our elite dentists and dental assistants work together using the highest standards of dentistry and patient services to restore functionality to your teeth and enhance the natural beauty of your smile. When it comes to professional dental fillings, we provide every patient with a stress-free, comfortable, and relaxing experience. When you choose us, you choose expertise, reliability, and a beautiful, healthy smile. A filling functions as a protective agent for the decaying areas of damaged teeth. This prevents invasive bacteria from entering the problem area, making your teeth more resistant to decay. By providing safe, effective, and convenient solutions for the problems associated with tooth decay, we can utilize fillings to restore damaged teeth to their normal shape and functionality. When you come in for a filling on the day of your appointment, the dentist will first extract any decaying tooth material before the entire affected area of the tooth is cleaned. 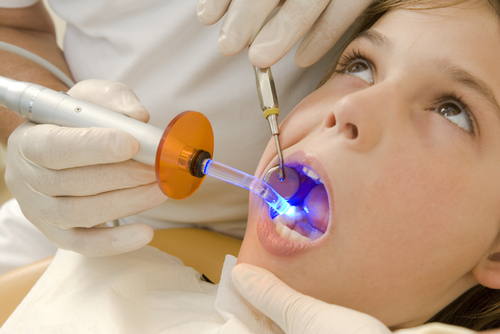 After cleaning, a filling material is used to fill the cavity. Your dentist will take the appropriate steps to ensure the filling is set and secure so you can get back to everyone’s favorite activity: eating! There are various materials used for fillings that vary in price, physical resistance, and hardness. All modern filling methods and materials used by our team are designed to be safe, effective, and comfortable. Our team goes beyond basic preventative dental maintenance; we offer a variety of services to suit your dental needs. Visit Family Dental Care Center Today! With this information, we hope you are better informed on the filling process and the benefits dental fillings provide for the health and longevity of your teeth. Our team of dental professionals are always more than happy to discuss your particular needs and goals before and after the procedure. If you live in Lansdowne, Drexel Hill, Aldan, or any of the surrounding communities, contact us today to learn why Family Dental Care Center is the go-to provider for all of your dental filling needs. We look forward to seeing that bright and beautiful smile frequent our office for years to come!